This is a big year for June in Buffalo, marking both the 40th anniversary of the festival's founding and the 30th anniversary of David Felder's tenure as artistic director. Under Felder's direction, the festival changed significantly, placing a greater emphasis on student works, and bringing in a wide range of skilled composers, performers, and ensembles. Felder, who serves as the Birge-Cary Chair in Composition at UB, has long been recognized as a leader among his generation of composers. This year, JiB will see the performance of several of the composer's key works, including his brass quintet, Canzone XXXI (to be played by the Meridian Arts Ensemble), his set of orchestral variations, Six Poems from Neruda's "Alturas…" (to be played by the Buffalo Philharmonic), and his recent Les Quatre Temps Cardinaux, which will be performed by SIGNAL with members of the Slee Sinfonietta (see our post from its October performance). The latter work, a fifty-minute song cycle for two voices, chamber orchestra, and 12 channels of electronics, sets poems by René Daumal, Robert Creeley, and Dana Gioia. All three works, like most of Felder's output, are characterized by their energy, lyricism, and what Dansk Musiktidsskrift has called "an impressive ability to establish a sound universe, in which one is taken through every corner of experience." I recently had a chance to interview Felder about the festival, and some of his recent work. When you restarted the festival in 1986, what were some things you set out to do differently from the way it was run in the past? It was a very big philosophical change, which was based on the way I assessed the field as a young composer myself at that time. When I was in California, I was like a lot of other younger composers. I didn't really feel that I'd had a good performance of my work until I was about 28 years old. It was mostly student performers or conservatory faculty members who didn't care at all about playing a younger composer's work. Though I could understand why people didn't want to spend the time on a young composer's work, I thought it was really difficult for me and every other young composer I knew to evaluate what we were trying to do. I took a look around, and I saw that there were only a few other opportunities for young composers to have strong performances of their work. Those were places like Aspen, Tanglewood, Davidovsky's summer program at Wellesley, and the summer program at Yale (the latter of which I was fortunate enough to attend). But those programs were extremely selective and almost entirely Ivy League, so the majority of younger composers around the country were kind of stuck, particularly the composers on the West Coast. So I began a series of concerts at the La Jolla Museum of Contemporary Art, which lasted two or three years. I was given some venture capital and programmed some young composers and some senior composers that were friends of mine. 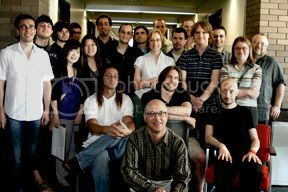 Then, when I moved to Cal State Long Beach, I formed the Summer Composers Institute, which was meant for West Coast composers to work with senior composers—the two who started it with me were Bernard Rands and Donald Erb—and we brought together this group of really great performers and ensembles to perform their works. By the time I moved to Buffalo, the June in Buffalo festival had been dormant for a long time. So I proposed that I bring my vision and restart the festival, but under the terms I'm outlining here. I considered Feldman a friend and had great respect for him, but we had differing views on what it meant to be a young composer. He did not believe that young composers deserved to be presented in the way that I was presenting them. He thought that they should sit at the feet of the geniuses and catch any pearl that might fall from their lips. So the old June in Buffalo program did not feature performances of young composers' music, they just sat in seminars, and the concerts were portrait concerts of individual faculty composers. It's a very different philosophy about how one teaches and how one helps young composers develop. What were some of the difficulties restarting a festival which had been dormant for several years? When I arrived, despite promises to the contrary when I interviewed, there was absolutely no money. So I had to do everything with zero budget, and I had to raise the funds completely those first years. I was able to find some interesting solutions, and the budgets started to stabilize after the third or fourth year, particularly when I became the Birge-Cary Chairholder and could dedicate resources. I am proud that even from the beginning there was never one year in which there was a deficit. Also, the first year we had to work hard to get applicants, I had to call around a lot. Very soon, though, we began to attract a large pool of applicants, allowing us to be very selective about who we decided to invite. And the festival fairly quickly became an obvious success. And now, there's not a week that goes by where I don't see another new festival imitating JiB. There are loads of them out there now—even some of our former student assistants for JiB are copying us. It causes me to think about what the field might need next, since such events have proliferated now to the point of near-absurdity. Are there any JiB performances that you have found particularly memorable? There was a New York New Music Ensemble performance of an amazing work by Jacob Druckman called Come Round, which is really one of his great pieces. 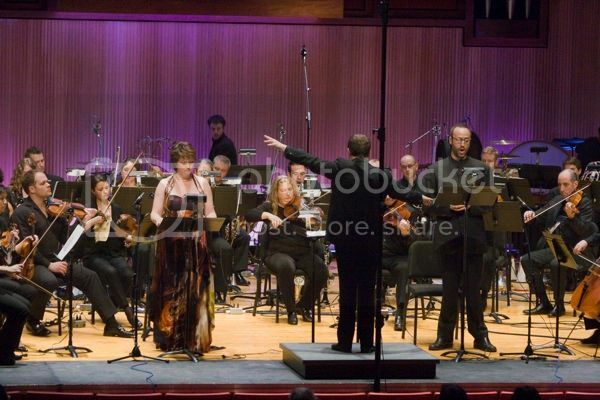 I just remember that the performance [at JiB 2000, conducted by Harvey Sollberger] was absolutely hair-raising! And a few years ago , Charles Wuorinen conducted the Slee Sinfonietta in a performance of his chamber cantata, It Happens Like This. That was a really great performance. Having the composer here conducting the group was really very special. But there are so many of them, it's really difficult. So I'm singling out just a couple which were absolutely breath-taking. The Performance Institute is doing the Druckman this year on their June 5 concert at Kleinhans. Right, and that's being programmed because we really wanted to get that piece on the festival. Jake Druckman was a big part of the early years of JiB, he came quite a bit and he was extremely supportive of me and also supportive of the festival. It seems that there's always been a lot of variety amongst the faculty composers who have been here over the years. One of the hallmarks of the way that I program the week is that I don't bring in people to be on the faculty with all the same viewpoints—in fact, I actually deliberately select people so that there will be some friction between ideas, so that students might get input that's 180º opposite from one master class to the next. I mostly enjoy very diverse groups of composers working together because you can learn the most that way if you have a strong individual internal motivator and your own vision to follow. If you're looking for consensus, JiB is not necessarily the place for you. Were there any JiB performances of your own works that are especially significant to you? In 1988, I wrote these solo pieces which are known as the Crossfire series, one of them is BoxMan for trombone, and another is a solo violin piece called Another Face. Those were pieces that were supposed to be done with video walls. We actually managed to do them here before they were done in Huddersfield and Vienna and some other places. So we brought in the video walls and mounted the production of those pieces which was very difficult to do in those days. Moving 24 television sets—which were extremely heavy—and setting them up as walls and then doing all the programming and the performances was really a trip. But the pieces were great in that format, and they worked extremely well, so that was a big highlight for me. The performances by trombonist Miles Anderson and violinist Karen Bentley were extraordinary! Otherwise, any time that I hear my string quartets played is great. For example, a few years ago , JACK astonished me by playing the living hell out of my second quartet, Stuck-stücke, and that was really gratifying. Of course, the Ardittis play it extremely well, but to then have a next generation quartet pick it up for the first time and play it absolutely brilliantly, that was wonderful! One of the new things the festival has been doing in recent years is the Performance Institute. There have been a lot of initiatives over the years, I've tried to do a lot of different kinds of things. Years ago we had an emerging ensembles program, so groups that were just coming out of conservatory or had just formed in New York were invited to come and be resident ensembles at the festival. For example, Brad Lubman had a group when he was at Stony Brook called the New Millenium Ensemble, which had just formed, so I invited them to come. The Meridian Arts Ensemble was another one of the original groups that came under those programs, and there were lots of others. We also tried a couple computer music initiatives. And then we did some thematic programming for a number of years, where we looked at specific interactions between, for example, "Music and Text," and so forth. The Performance Institute is another initiative, it's something that we're piloting right now to see how it might work, and it could be a nice broadening of the festival. Is there anything in particular you're looking forward to about this year's festival? First of all, I'm really looking forward to seeing so many of the faculty members. The composers who are coming are people who have been really important to the festival over the years for a variety of reasons. These are many of the people who have been here the most, who have been the most supportive and probably the most performed—with the exception of Martin Bresnick, who has only been to the festival once before. I've known him a long time and he's an extremely important teacher and composer, so this is a great opportunity to bring him back to fulfill the mission. What would you say is the most significant development in your music since the mid-1980s when you restarted the festival? I see it all as one very connected line, so I don't think that there have been any giant changes. I would say that the work has perhaps become less technically demanding in terms of what is asked of the players, and more demanding in terms of their ability to contribute just the right sound. In some of the earlier work there's a lot of complexity on the page, which may not have yielded the same level of complexity in the sounding result (this is typical for younger composers). So I'm happy now to allow the complexity to exist in the sounding event, and I take a lot of joy in getting out of the way more than I used to. It seems like there's an increasingly present "spiritual" component—for lack of a better word—at work in your music (I think of Shamayim, Requiescat, and Les Quatre Temps Cardinaux), which seems to contrast with older pieces like Linebacker Music or Canzone XXXI. It is there, and it's strongly there underneath. Even if you look at the earlier pieces, the sources may appear less overtly "spiritual," but what's underneath the brass quintet, for example, is Dante. What's behind that piece is an unfinished canzona from La Vita Nuova. So it may be a little more on the sleeve now, but it's always been there. That's interesting, because it seems like a lot of your works make direct reference to, or take inspiration from, poetic texts (e.g., Six Poems from Neruda's “Alturas...”, Les Quatre Temps Cardinaux). I think the reason goes back to when I was coming of age as a composer. The older fixed forms held no appeal for me at all. I was not interested in writing multi-movement abstract suites, nor was I interested in following any of the existing fixed forms, instead I was looking to try and create my own formal vehicles and containers. There are many ways to create those containers. For example, if you go back and read Simple Composition, Wuorinen argues very convincingly that one can extrapolate from aspects of the time point and build the form purely from concrete musical abstraction. But for me, I wanted to find something that could be an inspirational touchstone, either that I could constantly refer back to as a way of looking to see if I was actually doing what I thought I was, but more importantly, to give me the opportunity to create forms which were modeled on some kind of psychological or spiritual profile that could be extracted from texts—not so much literally, but more as a way of modeling a behavior. So, for example, the piece BoxMan refers to the novel by Kōbō Abe. I was reading that at the same time I was reading Konrad Lorenz's book, On Aggression. In that book, Lorenz is looking at the long relationships of Greylag geese: they pair up, male and female, and stay together for virtually their entire lives. And yet, they manifest these varying kinds of aggressive behavior, which he studied as a way of looking at aggressive behavior in people. Somehow, that was assembled in my mind with the lead character called the "BoxMan" in Abe's novel, and the result was a form which was a pure musical abstraction—one that works like a long set of variations. The controlling forces in the variations are some behaviors that I abstracted from those two books. So that's why you see some performance directions in the score like, "threatening," or "manic." Your recent piece, Les Quatre Temps Cardinaux ["The Four Cardinal Hours"], is a much more large-scale form, which is based on the cycle of a single day. It occurs to me that a lot of large-scale works seem to take these seemingly mundane cycles as stepping-stones to larger forms (e.g., the days of the week in Stockhausen's Licht, or Joyce's Ulysses, which is also based on a single day). Were any of those earlier works reference points for you? Not directly, but when I interviewed Stockhausen, he said something that was very powerful for me. I had asked him about circular forms, and he said, "No, it's a spiral." I hadn't ever considered that before, and that simple sentence changed a lot for me in my own thinking about form. The idea is that these are ways that we measure temporal existence. So that's why larger works have a tendency to use these as models in some way. The very short Daumal poem, which is at the heart of LQTC—something he did very late in his life when he was close to death, after not writing poetry for years—was extremely powerful to me for its simplicity and clarity. When he was a young man, he wrote extremely complicated automatic writing pieces, but through the course of his own creative life, and his contact with Hindu art-forms, he came back to something that was extremely simple but very powerful and direct, in that it works on an inner level with its imagery. The other poems, by Robert Creeley, Dana Gioia, and the reference to Pablo Neruda, are much more personal articulations of that larger transpersonal kind. One of the great things about Creeley is that he can take a very simple moment that occurs in a day, and connect it, in a very subtle way, to much larger senses of time. For example, there is one poem of his [“Kitchen” from Thirty Things, 1975] in which he's in a room, watching the light change as it comes through some lace curtains, but he's watching the light change indirectly on the floor, and that's a reference point. It's very subtly done, he doesn't draw attention to it, but through that illustration the individual poet is connecting the passing of his own life to the larger life of man. So that was the idea of the formal wheel in LQTC. You also seem to have a predilection for lower voices in your music. Contrabass clarinet, contrabass trombone, and bass flutes all figure prominently in some of your works, and the last movement of LQTC focuses almost entirely on the orchestra's lower range. What attracts you to these lower pitch extremes? I'd say I'm attracted to the unexplored regions, it's like Amundsen going to the South Pole or people who go down into the depths of the ocean in bathyspheres. I know there's a power in the low register that is very profound. Much of contemporary music has been very focused on the attack point, but I'm interested in the movement of voices in the lower register which are not solely based on attack point or harmonic movement but are instead coloristic or resonance-reinforcing movements. I'm also interested in the very highest registers. There used to be three body types people talked about: ectomorph, mesomorph, and endomorph. I used to joke that I was mesomorphic (which is a body type that is wider at the hips), and so much of my music revolved around middle C and the octave below. I think it's because of the tessitura of my voice: I was a tenor-baritone and was a singer my whole life, so naturally, somehow, that's where my pieces originated. And I noticed years later that many of my pieces work out from that register. Even LQTC begins its unfolding from the F# in that octave. Yes, it's meant to start there, due to the importance of B (the piece is very A/B centric). The F# is also important because it's the 11th partial of a C fundamental. And if you look at the piece, you'll see that there are certain pedal tones in the beginning, which essentially set out the work's major harmonic focal points. I’m definitely looking forward to hearing that again at the festival this year. Finally, when it comes to June in Buffalo, its legacy, and its longevity, what are you proudest of? I don't know that I think in those terms. If I had to answer that, I'd say that we've probably done performances of around 700 or more young composers' pieces, and those performances and the help that we've given to people over the years, I think has been really important to the profession. I'm extremely grateful to the University at Buffalo, and Buffalo arts organizations, as well as our donors, university patrons, audiences, and composers—both student participants and faculty members—who have participated and supported this endeavor over the years. Without that support, we certainly would never have gotten off the ground. So it's very gratifying to continue to feel that Buffalo is a place that supports work that is innovative and hopes to advance the conversation about the ongoing developments in the field, whatever they may be. June in Buffalo has certainly been a locus for the musical conversation to continue, with energetic and adventurous performers willing to dive into the uncharted territories being carved out by today's composers. And the festival will surely continue for years to come, with hundreds more young composers hearing great performances of their work, further encouraging these emerging artists to keep surveying unexplored sonic regions. Few ensembles can boast performing works by both American minimalist pioneers and cutting-edge European avant-gardists, fewer still can perform each with equal elegance, expressivity, and fluency. Signal is one of these. The ensemble has made a name for themselves in the past seven years by working closely with both Steve Reich and Helmut Lachenmann, while producing diverse programs that include works by Ligeti and Lang, Boulez and Wolfe, Andriessen and Ferneyhough (and even, occasionally, 18th century music). "We’re no longer plagued by notions of borders," Signal's director, Brad Lubman tells Thought Catalog. "No one tells you, 'You have to play it this way' or 'You have to play it that way.' It’s a very open time. And because of that we’re seeing an explosion of compositional languages." Seeing an explosion of languages is one thing, mastering so many of them is quite another. But Signal often makes it look easy, performing even the most complex music with an agility that seems to disguise the intricacy—and difficulty—of such works. "My viewpoint is that I don’t feel one should ever say anything is difficult," Lubman continues. "What I’ve found is that even with some very complex music, once you’ve spent enough time with it, once you assimilate its features, you start to grasp the particular style and realize it’s not really difficult. You just have to spend the time with it." Signal was founded in 2008 by Lauren Radnofsky and Lubman. Radnofsky, Signal's executive director and principal 'cellist, is an important figure in contemporary string music, regularly presenting adventurous music with and without the ensemble (including appearing as the soloist in Saariaho's Amers and collaborating with JACK Quartet in performances of Xenakis's music). Lubman has been a frequent guest conductor in many of the world's leading ensembles and orchestras, including Ensemble Modern, Klangforum Wien, and the St. Paul Chamber Orchestra. Since its formation, Signal has performed over 100 concerts, including the premieres of more than 20 new works, while co-producing five recordings (including a critically-acclaimed new recording of Reich's Music for 18 Musicians). Lubman's relationship with June in Buffalo extends back nearly twenty-five years. In 1992, he made his JiB debut conducting Charles Wuorinen's ornate chamber work On Alligators, while also seeing the performance of his own Trigram. 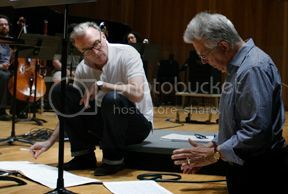 He returned to the festival several times throughout the decade, bringing his New Millennium Ensemble in 1994 and guest-conducting the New York New Music Ensemble in 1995. 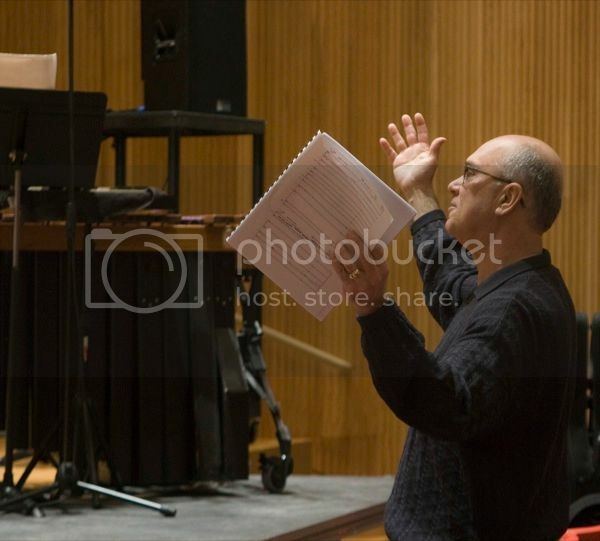 In 2000, already a renowned interpreter of Steve Reich's music, he conducted the June in Buffalo Chamber Orchestra in a performance of the composer's City Life, while sticking around to conduct the Slee Sinfonietta in Bernard Rands's Concertino (a piece he reprised with Signal just last year). Three years later, Lubman returned to conduct a stellar performance of Reich's Triple Quartet. 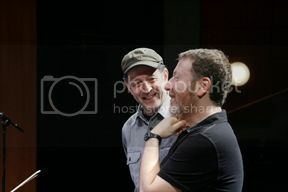 A particularly important performance took place at JiB 2007. Lubman, already laying the groundwork for what would eventually become Signal, conducted the Slee Sinfonietta—augmented with several NY-based performers that would eventually play a crucial role in Lubman and Radnofsky's ensemble—in "An Evening with Steve Reich." The performance featured two key works, including the then-recent Daniel Variations, and the rhythmic set of psalm-settings, Tehillim. This proto-Signal concert hinted at what was to become, according to the New York Times, "one of the most vital groups of its kind." Signal's first June in Buffalo was in 2010, and since then, the ensemble has become one of the most vital groups to the festival, returning every year to perform works by both student composers and faculty. That first year saw another Reich portrait concert, including the unique pairing of the composer's Sextet with his recent Pulitzer-winning Double Sextet. The following year, the ensemble returned to feature Ligeti's Chamber Concerto alongside David Felder's Journal—and, who could forget the full-on assault of Signal's performance of this writer's The Contrabulous Fabtraption of Professor Horatio Hufnagel? (I can't, at least.) 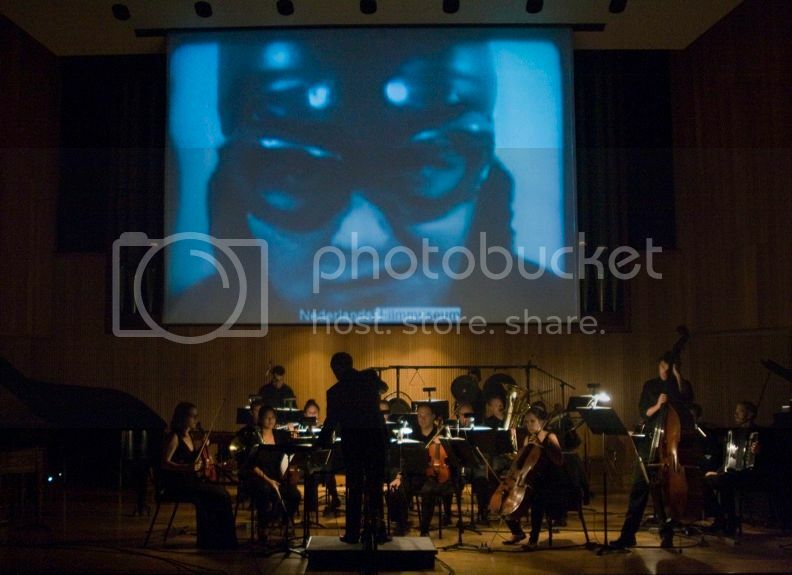 2012 saw the ensemble's first multimedia performance, featuring Julia Wolfe's Impatience—a quasi-symphonic work accompanying Charles De Keukeleire's quasi-Futurist film of the same title. Signal presented a particularly ambitious program the following year, giving strong performances of two complex—but not difficult—violin concerti: Augusta Read Thomas's Carillon Sky and Brian Ferneyhough's Terrain, both performed with Irvine Arditti. The program ended with a show-stopping performance of Wuorinen's Big Spinoff. This year, the ensemble returns for their sixth JiB, to present (with members of the Slee Sinfonietta) David Felder's Les Quatre Temps Cardinaux. Lubman premiered the evening-length piece in 2013, stunning the audience with his incredible ability to command not only the large ensemble onstage with his characteristically sweeping gestures, but also to cue the electronicists seated in the back of the hall with equal urgency. That, coupled with Felder's 12-channel electronics, made the audience feel like we were seated within the ensemble, with intriguing sonic action unfolding all around us. We look forward to seeing the reprisal of this performance, a virtuosic display of compositional artistry and performer dexterity. It takes just such an ensemble to perform a piece such a this: one that is able to assimilate its features, grasp its style, and belie the fact that surely this music is quite difficult. In Roger Reynolds' …the serpent-snapping eye, sounds seem to come from all directions, simultaneously resulting from previous gestures while also seemingly materializing from nowhere. Unison sonorities grow more and more vibrant until they suddenly erupt into lively gestures, before seamlessly dissipating back into the void. Even on a simple stereo recording, there is an amazing evocation of space, while the periodic vertical sonorities mark the passage of time—a time that is continuously stretching and contracting, like a breathing organism, constantly manipulating both space and memory. The feedback process is so important and is very rare in my experience. […] I already know what my own imagination is going to produce. What I don’t know is exactly how that imagined sound is going to intersect with the physics of the instrument in the moment of real performance. So I think [the performers] make the opportunity to engage with the medium. In addition to collaborating with performers, Reynolds has worked with a wide variety of artists in other media. Many of his electronic pieces are the results of close work with musical assistants (particularly those composed at IRCAM, including Archipelago for chamber orchestra and live multi-channel electronics). In 1991, Reynolds provided incidental music for the Tadashi Suzuki Theatre Company's performance of Chekhov's Ivanov, the result of continued artistic exchange between the composer and Suzuki. Just a few years earlier, Reynolds, moved by John Ashbery's Self-Portrait in a Convex Mirror, composed an orchestral response, Whispers Out of Time, which won the 1989 Pulitzer Prize. Reynolds and Ashbery later collaborated on the evening-length song cycle, last things, I think, to think about, for bass-baritone (Larson), piano (Karis), and electronics, the latter of which consisted of recordings of the poet reciting his text. His most recent large-scale work, the 'symphonic vision' george WASHINGTON, features collaborations with Ross Karre (video), Jaime Oliver (electronics), and Josef Kucera (sound engineering). For Reynolds, such collaboration creates a symbiotic relationship, as he told New Music Box: "You enter into a relationship with one or more people and you have to sacrifice some of your autonomy and they have to sacrifice some of theirs in order to get to a place that you couldn’t get without each other. And I like that kind of situation." None of this is to suggest that Reynolds' works are "co-compositions" or are incompletely his own—quite the opposite, in fact. In getting immediate feedback from performers who are directly engaged with the composer in the process of creation, in relying on musical assistants to code his algorithms, and in working with poets to create the raw textual material for a piece, Reynolds has freed himself to be more expressive, to allow his voice and gestures more space in which to move and develop. …the serpent-snapping eye hints at this element, but it reaches farther. There are pieces which involve the physical movement of sound in space, like the early theatre piece, The Emperor of Ice-Cream, in which phonemes are passed back and forth among eight singers spread out across a stage, or Watershed IV, which maps out an array of percussion instruments and uses surround-sound speakers to locate the audience within the geometrical arrangement of sound sources. But then, most significantly, there is the treatment of sounds as elements which themselves exist and interact in spaces—a sensitivity Reynolds inherits from Varèse. This can be heard in much of Reynolds' work, and is described by the composer as "spatialization as subject." One of my favorite memories of June in Buffalo centers around such an acoustic space created by the composer. At the 2010 festival, Reynolds presented a mid-day "lecture," which turned out to be an early installment in his Passage series, a group of multimedia works centered around Reynolds' own narrations: memories of conversations, meals, and ideas shared with several composers he's known throughout his life (including Takemitsu, Cage, and Xenakis). After a week of intense, adventurous, spiky new music, this sparse, surprisingly pacifying presentation was intensely welcome, as Reynolds—looking strangely like Beckett in his black turtleneck—allowed his warm baritone narrations to envelope the audience. The piece, while basically a solo Reynolds performance, seemed itself to be a collaboration of sorts: the artists who helped make these stories contributing in their own way to the piece without knowing it. And Passage seemed, in an oblique way, to be representative of what June in Buffalo is itself: a space in which artists can meet, interact, exchange ideas, and create stories. We're thrilled that Roger Reynolds will be joining us on this anniversary year, and look forward not only to his presence as a teacher and a thinker, but also to the performances of his works, which will include Eric Huebner's presentation of the first book of Piano Études, and Irvine Arditti's performance of the large-scale violin solo, Kokoro. Both are sure to be continuations of Reynolds' ongoing mastery of space and memory. 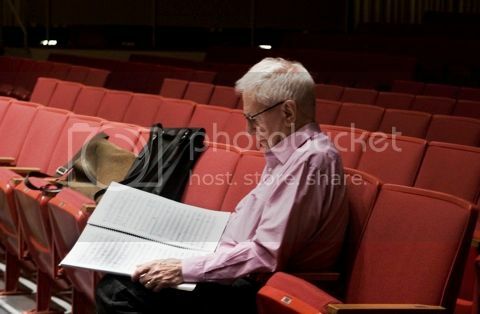 Last year, the Chicago-based, English-born composer Bernard Rands celebrated his 80th birthday. To honor this milestone, the Boston Symphony Orchestra commissioned a new work, Concerto for Piano and Orchestra, which featured pianist Jonathan Biss. 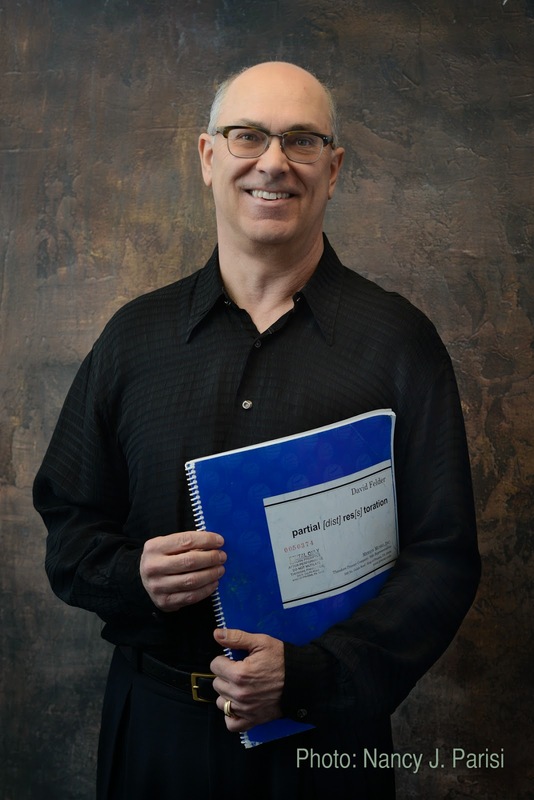 Rands shows no signs of slowing down—the concerto is just one of over a hundred of his published works, and later this year, he'll see the premiere of another new concerto, for English Horn and orchestra, which is being written for Robert Walters and the Cleveland Orchestra. You don’t see sunflowers like that! […He] painted to see the world in his mind, not the world as it is, or in the reality of normal observation. The world in his mind made him so different, and made the paintings so different from anybody else’s. When you think of that in terms of the sonic domain in which we work: what is the sound in my mind, not what it ought to be but what is in my mind. […It] has to leap off the page and be something other than what’s technically possible. 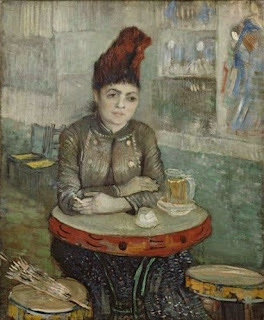 Rands's preoccupation with van Gogh did not end with the Le Tambourin suites, but continued into what is perhaps his most large-scale work, the two-act opera, Vincent (1999). With a libretto based on Van Gogh's letters by J.D. McClatchy, the opera aims to place the artist "in contexts which were his real experiences, thus revealing his complex character—that of genius artist, religious fanatic, alcoholic, epileptic, unstable of temperament, resulting in behavior ranging unpredictably between kindly affability and violent aggression." Premiered by the Indiana University Opera School in 2012, the work displays Rands's characteristically colorful orchestral writing alongside his keen knowledge and skill in composing for voice. The vocal line remains absolutely the same in the chamber and orchestra versions, but they’re not the same pieces. […] Let’s say in the chamber version, before there’s any intention to make an orchestra version, you have a five-note chord, which is perfectly fine for an orchestra. But what if you add one more note to that chord? Where does it go? Does it go here? There? […] If you add two, where do they go? And, if you add more, and you start to change the harmonic implication, you’ve got a very different environment for the voice to perform exactly as it would in the other version, but now we have an extension of the juxtaposition of differences that are very important. Rands's history with June in Buffalo stretches back to before David Felder restarted the festival in the mid-1980s. 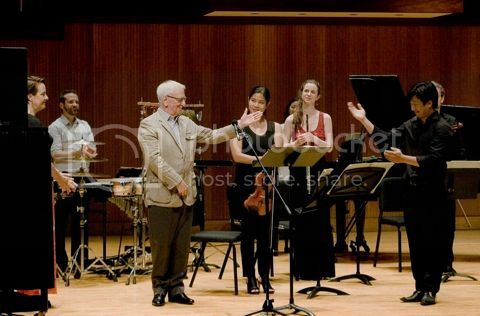 Before reigniting the festival, when Felder was teaching at Cal State Long Beach, he started a summer program for West Coast artists called the Summer Composers Institute, which brought together young composers with emerging performers and ensembles and gave them a chance to work with faculty composers, one of the first of which was Bernard Rands. 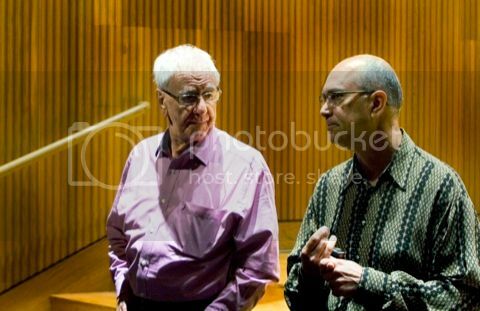 Rands was quick to offer Felder his support when the latter restarted June in Buffalo, and since then, Rands has been an important figure in the festival's history, being a faculty composer more than ten times, and seeing nearly thirty performances of his works at the festival. These include the world premiere of Rands's Interlude, which was commissioned for the festival's 25th anniversary in 2000, and three performances of Canti Lunatici (in 1991, 2002, and 2014—the latter at a portrait concert which also featured Steven Beck playing Rands's Piano Preludes). Several of the composer's "Memo" series of solo works have been heard at the festival, including Memo 1 for contrabass in 2000, Memo 7 for soprano in 2002, and Memo 4 for flute in 2006. Rands's virtuosic orchestral compositions have been featured many times at the Buffalo Philharmonic's festival-concluding concerts, including a 2010 performance of the second La Tambourin suite, and last year's presentation of "…where the murmurs die…" (both conducted by JoAnn Falletta). This year, the festival's mid-week Performance Institute concert at Kleinhans Music Hall will feature two of the composer's works, Memo 4 and Walcott Songs, played by Performance Institute students and faculty. It so happens that one of the fundamental principles of my own aesthetic position is the juxtaposition of opposites. […] These two [the non-tonal and the tonal] are interacting all the time, whether it’s a harmony or a rhythmic cell, a timbre or a gesture. Music has always been that way. Otherwise, we would have used up its resources a long time ago. But it seems to be an inexhaustible phenomenon. As a composer, Rands seems yet to use up his musical resources, and is himself an inexhaustible phenomenon, still creating new, intriguing music into his eighth decade. Few performers have had a more significant impact on the contemporary music scene than Irvine Arditti. As the founder of the Arditti Quartet, he has worked with some of the world's most adventurous composers, commissioning hundreds of works, and recording over 180 CDs. Some of the most important string quartets of the past forty years have been composed for the Ardittis, including works by Brian Ferneyhough, Helmut Lachenmann, and Harrison Birtwistle just to name a few. The Ardittis are partly responsible for revitalizing the genre itself, which, along with the symphony, had fallen out of favor with many post-war composers. They even convinced modernist stalwart Karlheinz Stockhausen to write a string quartet (albeit, one that required four helicopters). Working closely with composers is of great importance to Arditti. His introduction to the new music world happened at age 12, when he met Messiaen and Xenakis at the English Bach Festival. Just a few years later he was studying at the Darmstadt summer courses, with the likes of Stockhausen and Boulez. For Arditti, working with composers is a key part of the adventure. "I love the idea of going to the limit of what you can do," he says. "With the music I and my quartet play […] it’s all to do with getting inside a living composer’s mind. There is no performing tradition. We have to create it, we have to turn these very odd-looking marks into music which has never been heard before." Perhaps the most well known account of Arditti's virtuosity has to do with John Cage's Freeman Etudes. The famously difficult piece has been called "impossible" by James Pritchett, who compared its requirements to "a track and field athlete who must run, jump, and throw, but do so in rapid succession, and, at the same time, to have a dancer's control of the body, so that the feet always land in precise locations, the arms and legs bent at precise angles." Cage, who used star maps and the I Ching to determine most of the work's musical material, originally composed the work for a virtuoso violinist, who, upon seeing the first completed etudes, deemed them "quite unplayable." Discouraged by this verdict, Cage abandoned the project, until they were picked up years later by Arditti, who was not only able to perform the piece, but performed it faster than the notated tempo(! ), inspiring Cage to complete the project. In fact, Arditti—following Cage's performance note that the piece should be performed in "as short a time-length as [the player's] virtuosity permits"—has continued to increase the piece's tempo with each performance (see a recent performance below). With regard to the etudes' difficulty, Cage said, "These are intentionally as difficult as I can make them, because I think we're now surrounded by very serious problems in the society, and we tend to think that the situation is hopeless and that it's just impossible to do something that will make everything turn out properly. So I think that this music, which is almost impossible, gives an instance of the practicality of the impossible." Or, in Arditti's words, "Nothing is impossible if you rehearse it enough." 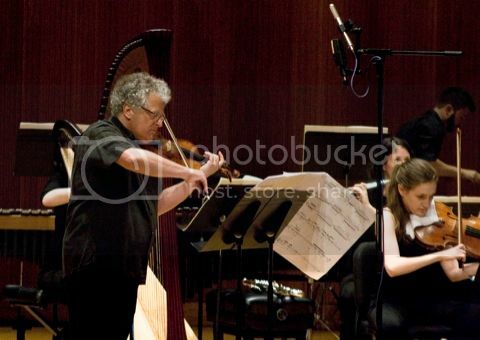 Arditti has been an important presence at June in Buffalo for many years, both as a soloist and as part of the Arditti Quartet. In 2007, the Ardittis were a resident ensemble at the festival, workshopping student pieces and presenting a concert of works including Roger Reynold's Ariadne's Thread, David Felder's Stuck-Stücke, and Lachenmann's String Quartet No. 3 "Grido", all of which were composed specifically for the quartet (indeed, the latter takes its name from the name of the quartet's members—the "i" in "Grido" is for "Irvine"). In 2010, the quartet returned for two sessions of student workshops, as well as another evening concert of exciting music, including Reynolds' Not Forgotten, Felder's Third Face, Xenakis's Tetras, and Feldman's early quartet, Structures (1951). That same year, Arditti performed Reynolds' Aspiration with the Slee Sinfonietta, another work composed for the violinist. In 2011, Arditti returned as a special guest to play two works on a chamber music concert: Hilda Paredes's Memoriam Thomas Kakuska and Salvatore Sciarrino's Sei Caprici—the latter, an extraordinary tour de force and study in extended string techniques, made a particular impression on the young composers present, with both the work's inherent virtuosity and Arditti's bold performance acting as a demonstration of the amazingly extensive sound-world of the violin. Arditti returned as a soloist in 2013, performing two works for large ensemble and violin with SIGNAL: Augusta Read Thomas's Carillon Sky and Ferneyhough's Terrain (the latter, another work composed for Arditti, which the Guardian has referred to as an "uber-concerto"). 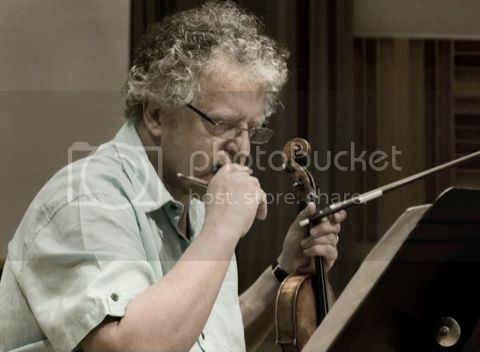 Also at JiB 2013, Arditti became one of the few non-composers to give a morning lecture (a small group that also includes Tonmeister François Eckert), taking the opportunity to demonstrate several extended string techniques and discuss strategies for composing for violin. Finally, last year saw Arditti performing Paredes's Señales with SIGNAL, in addition to presenting a full solo recital which included classic works, including the Sei Caprici and Donatoni's Argot, alongside more recent compositions like Martino Traversa's Red (2012) and Toshio Hosokawa's Elegy (2007). This anniversary year, Arditti will return for another solo recital of adventurous string music, including Ferneyhough's labyrinthine Unsichtbare Farben and Reynolds' Kokoro (both dedicated to the violinist), as well as Feldman's For Aaron Copland and Elliott Carter's famous Duo for Violin and Piano—definitely not a performance to miss. As Tom Service has noted, "Any Arditti performance is not just an interpretation, but a performance informed by decades of the subtle oral tradition of working with the world's greatest composers. They are living, breathing music history." Indeed, and not just a living history, but a demonstration of the "practicality of the impossible." There is a certain modesty to much of Harvey Sollberger's recent music, a conscious avoidance of the heavy teleological force and "storming of existential heights" characteristic of much 19th century music. Instead, Sollberger's music is, as he describes in his Essay Before a (Non-)Sonata, "a music that does not presuppose a fixed narrative that transports you invariably from Point A to Point Z; it's, rather, a music that has no agenda, that doesn't want to […] convince you of anything; a music that forgets—and must reinvent itself, sometimes obsessively—as it goes along. "* Rather than profound declarations of humanity's power, Sollberger prefers evoking "an occluded vision of something we catch a glimmer of or intuit the shape of but can't quite make out." This is a post-quantum-theory music, a music that embraces uncertainty, that is content to gaze at the Real and receive only an "occluded vision". Of course, as any fan of Monet or Pissarro can tell you, it is often the occluded visions that are the most arresting. Sollberger's history with June in Buffalo extends back many years. He was one of the core group of composers who immediately lent their support when David Felder restarted the festival in 1986, and he has played a significant role ever since—both as a composer and a performer. In 1993, he conducted the June in Buffalo Chamber Ensemble while they performed his piece, The Advancing Moment, and in 1996 he conducted an early performance of Felder's Inner Sky. In 1998, he guest-conducted the New York New Music Ensemble in a program that included works by Davidovsky, Ken Ueno, and Christian Carey, and conducted the same ensemble the following year for a performance of Wuorinen's New York Notes (the program also featured Sollberger's flute/clarinet duet, To the Spirit Unappeased and Peregrine). Sollberger has premiered several important works at June in Buffalo, conducting the first performance of Roger Reynolds' On the Nature of Things in 1996, and David Felder's In Between in 2000 (with the JiB Chamber Orchestra). 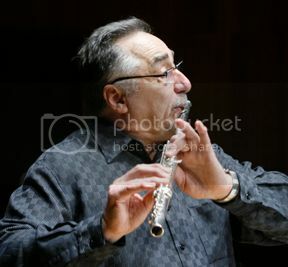 He has continued to be a reliable fount of exciting music throughout the 2000's: in 2006 he performed his flute solo Riding the Wind I, and performed the first in another series of flute works, New Millennium Memo I, at a special anniversary concert at JiB 2010. The week of this year's festival, Edge of the Center will publish an essay by Sollberger, called "Buffalo's Third Wave", celebrating the festival and its history. Sollberger's most recent works, including Mural for piano four hands and Soli e Scherzi for flute and piano (both 2014), embrace a new formal strategy the composer calls "Field form." Put simply, these pieces are circular and "can be entered and left at many different points," allowing the performer to begin at any location, and continue through the material until they return to the point at which they began. Existing in such a "Mobius space" these works lack the traditional teleological markers 'beginning,' 'middle,' and 'end.' As the composer explains, "What's 'center' in one performance becomes 'edge' in another," (or conceivably, the 'edge of the center' in yet another). This seemingly simple formal strategy creates significant compositional challenges however, since while these pieces lack 'beginnings' and 'endings,' they are not without development. Sollberger still deftly crafts the moment-to-moment evolution of his material, aiming to compose music that has a gas-like evanescence, with "the potential to assume the many forms and shapes of a cloud." For those who are familiar with the composer's earlier music, terms like "evanescent", and "gas-like" might not be the first terms that come to mind. At this year's June in Buffalo, NYNME will perform The Advancing Moment (1993), a piece which Jeremy Eichler of the New York Times described as featuring "tough, aggressive gestures," writing that the work "pitted groups of instruments against each other and built into a kind of pummeling fanfare, full of menacing extremes of pitch and volume." Fellow JiB faculty composer Roger Reynolds has written of Sollberger's "rhythmically craggy and motivically kaleidoscopic music of high expressive energy and gestural force." This is not just evident in the earlier, more "menacing" pieces, but also in his more recent work. Take, for example, New Millennium Memo II for solo flute (see above), in which the composer maintains the aforementioned 'expressive energy' and 'gestural force' through subtle shifts in timbral coloration, graceful developmental variations, and quick agile melodic fragments that are as rhythmically complex as they are effortlessly performed (by the composer himself). It is clear that Sollberger's style and technique is in a continuous state of evolution and reinvention, developing and varying in much the same way his musical material does. Attendees of this year's festival will be treated not only to NYNME's adroit performance of The Advancing Moment, but also to a unique Harvey Sollberger solo recital at Pausa Art House. The event will feature the composer performing works for solo flute and solo accordion(!). Indeed, Sollberger recently returned to the accordion, an instrument he had once studied, but with which he hadn't worked closely since 1956. His accordion repertoire, however, doesn't feature the spiky modernism composed by himself and his contemporaries, instead leaning heavily on polkas, waltzes, folk tunes, and especially Neapolitan song repertoire. It is perhaps this recent addition to Sollberger's musical life, more than anything else, that presents the composer as an artist with the "potential to assume the many forms and shapes of a cloud." He embodies the idea of the music that forgets—not in the sense that he is stricken with any sort of musical amnesia (indeed, quite the opposite), but rather that he, throughout his career and continuing into the future, seems to be driven by a need to reinvent himself, sometimes obsessively—as he goes along. *Sollberger, Harvey. "Essay Before a (Non-)Sonata" preface to Mural. (American Composers Alliance, 2014). (emphasis added). Music in Buffalo’s Historic Places presents violinist and University at Buffalo Assistant Professor Yuki Numata Resnick in a free noontime concert of solo and duo works by Antheil, Bach, Bartok and Honegger in the magnificent Common Council chamber at Buffalo's City Hall. She is joined by cellist and UB associate professor Jonathan Golove as well as by her husband, trumpeter Kyle Resnick. The Common Council chamber is one of Buffalo’s most revered civic spaces. Officially opened in January of 1932, it is widely regarded as one of the finest city council chambers in the country. The chamber features a beautiful stained glass sunburst, inlaid walnut woodwork and is ringed by stone pillars representing the virtues council members were expected to maintain. Yuki Numata Resnick was appointed assistant professor of music at the University at Buffalo in the fall of 2013. 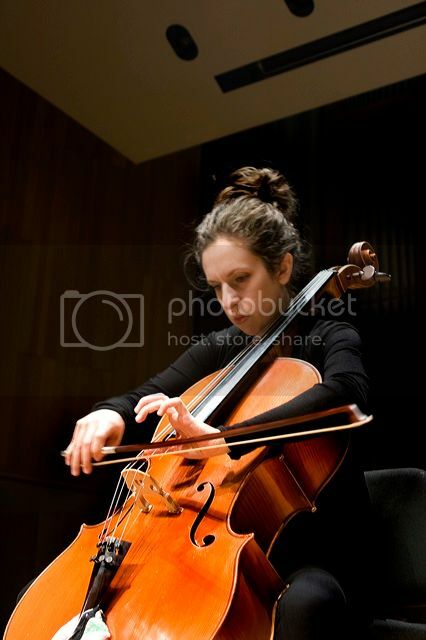 She is a highly sought after soloist and chamber musician who has performed internationally and with ensembles such as Alarm Will Sound, Enemble Signal, Wordless Music Orchestra, and the Talea Ensemble. A committed advocate of the music of our time, Yuki has premiered dozens of new works in recent years and is actively involved in the commissioning of new music for violin. She has also been engaged in a multi-year exploration of the music for solo violin by J.S. Bach and frequently seeks to link Bach’s music with the music of more recent composers. The noontime program opens with Arthur Honnegger’s beautiful Sonatina for violin and cello composed in 1932, the year City Hall was officially opened. The neo-classical work, traditional in sound and structure, isemblematic of how composers in the 1920s and 30s often looked back to older musical forms to help organize their music in much the same way the architects of Buffalo’s City Hall might have looked at ancient Roman architecture to inspire the design of the Common Council chamber. The program continues with two modernist works from 1931: a selection of Béla Bartók’s Duos for two violins, here played in a version for violin and trumpet and George Antheil’s Sonatina for violin and cello. The program concludes with J.S. Bach’s B minor Partita for solo violin. This concert is made possible by the generous support of the Robert and Carol Morris Center for 21st Century Music and by the City of Buffalo. The full program is available here. Don't miss this exciting event, a continuation of an always-exciting series!